Using the website www.meet-in-alsace.com implies full acceptance of the general terms and conditions of use described below. These terms and conditions of use may be modified or completed at any time. The users of the website www.meet-in-alsace.com shall therefore read them regularly. This website is normally accessible to users at any time. An interruption for technical maintenance may however be decided by www.meet-in-alsace.com, which undertakes to communicate to users the dates and times of the intervention beforehand. 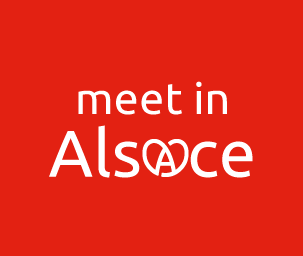 The website www.meet-in-alsace.com is regularly updated. Likewise, the legal notices may be modified at any time. They are however imposed on the user, who will have to read them as often as possible to be aware of them. No personal information is collected without your knowledge. No personal information is shared with any third party. The personal data collected via this website is contributed voluntarily via the forms provided on this site. This data is collected exclusively for internal use by the Agence d’Attractivité de l’Alsace, whether for the provision of requested information or for managing the sending of newsletters. Pursuant to Articles 38, 39 and 40 of the French data protection and civil liberties law of 6 January 1978, amended in 2004, and to provisions envisaged by the EU Regulation 2016/679 of 27 April 2016 entered into force on 25 May 2018, the user has the right to access, rectify and delete the information regarding him/her. Furthermore, the user has the right to limit the processing of data regarding him/her and the right to portability of his/her data. For legitimate reasons, the user may also oppose the processing of his/her data. These rights may be exercised by the user via a simple request, whether by writing an e-mail to info@meet-in-alsace.com, or by writing a letter to the following address: Agence d’Attractivité de l’Alsace – 24 rue de Verdun – 68000 Colmar. You can find further information about Google Analytics and data protection at this link: http://tools.google.com/dlpage/gaoptout?hl=fr or at this link: http://www.google.com/intl/fr/policies/privacy/. The information, symbols, photographs, images, texts, video clips, animations with or without audio, and other documents featured on this website belong to the Agence d’Attractivité de l’Alsace or to third parties authorised to use them. This content is protected by French and international law on copyright and intellectual property. Consequently, any partial or total reproduction, representation, adaptation or modification or transfer to another website is prohibited without the prior authorisation of the Agence d’Attractivité de l’Alsace. Any unauthorised use of the website or of any of the elements contained in it will be considered as constituting an infringement and will be prosecuted against pursuant to provisions of Articles L.335-2 et seq. of the Intellectual Property Code. The Agence d’Attractivité de l’Alsace may not be considered liable for any material errors which may be included in the documents featured on the website despite all the care taken at the time of publication. Moreover, the Agence d’Attractivité de l’Alsace may not be considered liable for any information, statements and opinions expressed on websites to which it redirects via hypertext links or over which it does not exercise editorial control. The Agence d’Attractivité de l’Alsace can no longer be considered liable for the insufficient or inaccurate transmission of data due to the various Internet networks or incompatibility due to the user’s browser.